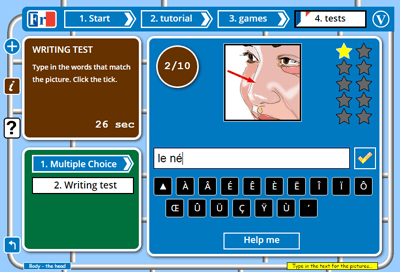 French Games is a free website for beginners learning French and offers a complete set of French lessons, practice games and French tests for over 100 French topics, both beginner and lower intermediate. Topics include Pets, Numbers to 10 and Daily routine as well as more challenging subjects like The environment and Media. Select options in the box below to get started! 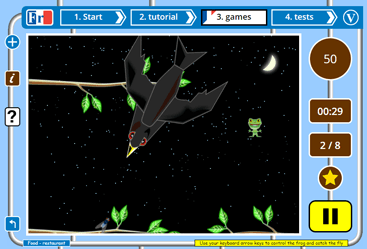 The frog flies game - learn French with the frog! 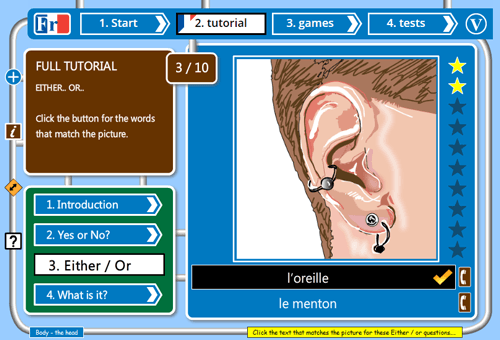 Start your visit to French Games with the lesson for your chosen topic. Each of our 100+ French lessons consists of an introduction to the topic language and 3 lesson activities - a yes/no activity, an either/or activity and a multiple choice activity. During the introduction to the topic lesson, it is important that you repeat the audio after you hear it, and write down the texts to help your memory absorb both the sound and look of that language. The 3 lesson activities are graded from easy to more difficult. As you work your way through them, you will find that your grasp and retention of the target language gradually improves. By the time you have completed the lesson, you should be able to recall and repeat the vocabulary for each of the topic items without prompting. There are 9 free games you can use to practice the French topic you are learning at French Games. The games are quick and simple to play and improve language retention by excercising different areas of the brain. Try a variety of games for the best results! The games are free to use and work on both tablets (including iPads) and desktop computers. Test your reaction times with our fast moving Rock fall game - click or tap on the rocks to save the road and win the game - fastest times leaderboard. Complete your topic learning session by taking our 2 tests - a multiple choice test and a writing test. These will confirm that you have fully grasped and are able to reproduce the French you have learned by doing the lesson and playing the games. French Games is so easy to use! You choose a topic, complete a set of simple lessons to learn that topic, play a series of French games to reinforce that learning and then take the two French tests to see how well you have learned your topic. And you can do that for free with over 100 different topics! To start using French Games click here or on the "1. Start" button in the navigation sign at the top of the page. On the Start page you choose the topic you want to learn. Once you have chosen a topic you can get straight on with the lessons. If you feel lost at any time, check out the Help text at the bottom of any page. There is also an FAQ page with more information about using French Games, and about other languages you can learn free with ic language. French Games is for adults and kids (and the parents of adults, and the grandparents of kids!) who need or want to learn French as a second language. You might be starting to learn French for the first time, or you may need to reinforce what you are learning at night class or at school or with your tutor with additional lessons and tests. If you are between five and seventy five, try out French Games and make your French learning a great way to spend some time! If you are the parent of a child learning French, you may want to check out our parents page for more information on how your child should use French Games to enhance their French language learning. If you have any comments or suggestions, get in touch on our Contact page.